Jared Kushner and wife Ivanka Trump made at least $80 million in outside income last year while working as White House advisers to President Donald Trump, according to newly-released financial disclosure forms. The president’s son-in-law and daughter together reported personal assets of between $240 million and $780 million by the end of 2017. Trump held more than $55 million of that, and Kushner, at least $180 million. Kushner and Trump received the majority of their outside income from real estate matters. Other income came from capital gains, Ivanks Trump's businesses, the Trump International Hotel in Washington, D.C., and from the Trump Corporation salary and severance. While this is an increase from the total value of assets between $206 and $760 million the two reported in the last disclosure form, it's difficult to make a direct comparison because the latest filing covers a shorter period of time, between January 2017 through December 2017, whereas the last report covers January 2016 through April 2017. The two reports also have an overlapping period between January and April 2017. Ivanka Trump reported a stake in the Trump International Hotel in Washington, D.C., valued between $5 million and $25 million. Quickly becoming one of the most popular get-together spot for Republicans and Trump supporters across the world, the luxury hotel on the historic Old Post Office site, which opened September 2016, has brought in nearly $4 million for the president's daughter in 2017, up from the $2.4 million reported in the 2016 statement. 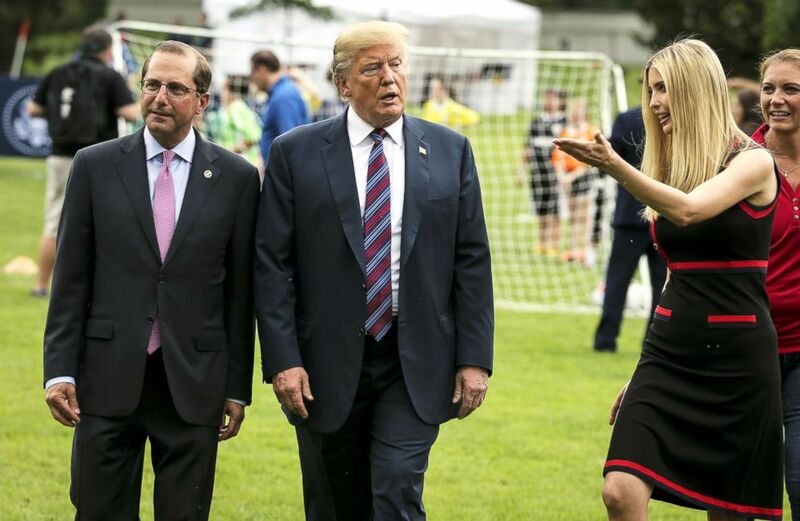 President Donald Trump, Health and Human Services Secretary Alex Azar and Ivanka Trump walk as they watch young participants during the White House Sports and Fitness Day on the South Lawn on May 30, 2018, in Washington, D.C.
A spokesperson for the two said that their net worth has not changed much and stressed that they have complied with government ethics restrictions. “Since joining the administration, Mr. Kushner and Ms. Trump have complied with the rules and restrictions as set out by the Office of Government Ethics," Peter Mirijanian, spokesperson for Abbe Lowell, Jared Kushner's attorney and the couple's ethics counsel told ABC News in a statement. According to President Trump's own annual financial disclosure form released last month, his Washington, D.C., hotel had a banner year, raking in over $40 million in income between January and December 2017. Trump has come under scrutiny from ethics watchdogs who have accused the president of using his office to promote his properties. The hotel has been the target of lawsuits that allege it's a violation of the Constitution for Trump to received what amount to illegal gifts from foreign governments in the form of payments to his hotel.